Wow, a little bit of Switzerland in South America! After a 10 hour over night bus from Trelew to Esquel (no DJ mixes this time, instead a Jennifer Anniston Rom Com classic called ´Just Go With It´), and then a local bus for 30 minutes from Equel South we arrived in a town called Trevelin on Thursday. The first thing you notice is the mountains and the trees- completely different landscape from East coast Argentina where we had just come from which is arid desert basically. It goes without saying (my Swiss origins and all!) that I much prefer the snow-capped mountain, evergreen tree backdrop that we would be calling home over the next 3 days. We arrived at our hostel- Casa Verde- and just chilled, drank lots of tea and admired the amazing view which you can see in the pic above. The hostel is a log cabin and terribly cosy that made it hard to leave. But we managed to get out the door after lunch and made our way to the town´s Welsh Chapel called Capel Bethel and the adjoining school Ysgol Cymraeg. Where Gaiman was the Welsh stronghold in the East of Patagonia, Trevelin is its equivalent in the West. The Capel in Trevelin is much smaller than the one in Gaiman and is rarely used for worship but Azeus (the schools Argentinean Welsh teacher) who showed us round said that they were organising a service for Christmas. We also met a guy called Iwan who is from Porthmadog and is a permanent ´Mentor Patagonia´person covering Esquel and Trevelin promoting the Welsh language and such like. They both then showed us around the school. Ysgol Cymraeg currently has 20 adult and 20 children Welsh learners who come for around 1 1-2 hours after school for lessons. Azeus was marking Welsh language exams at the time, at which point he asked me (in Welsh) whether i would like to sit the exam too…I answered ¨Dim Diolch!¨ (¨No Thanks!¨) The school and the Capel were very basic building but the setting was amazing…the snow topped Andes surrounding the two buildings- spectacular. Thursday evening was an evening of meeting and greeting and mate. Lets start with the meeting and greeting…We met up with Clare and Victor at the hostel to talk about our plans for the next 2 days with them. Clare works for the British Council on a project promoting the Welsh language in the area and is also a distant relative of mine on my Mum´s side! Victor is her partner who is also a tour guide and he was to take us out and about over our time in Trevelin! Iwan and Azeus from Ysgol Cymraeg also popped in and we had some Argentian liquor which was yellow and tasted a bit of Mohito! It was a random quadruple language evening with me being the only first language English speaker in the room (that doesn´t happen very often!). We had Welsh, Spanish, French and English. And the conversation spanned all 4 languages, all at the same time at some points! I went to bed that evening with my head spinning and Hedd and I trying to piece together what we had just spoken about for the past 2 hours! We also had our first try of ´Mate´, a traditional Argentinean hot drink. Its made from dried leaves from the Yerba plant and is drunk from a palm sized wooden pot through a silver straw with a filter at one end. We had seen it everywhere in Argentina and were keen to try it. It’s a very social thing, you see groups of friends or family sharing a Mate, passing it around the circle catching up on gossip as they do. Our hostel manager Hoolie made one for us and I tried my hardest not to show my dislike for it after my first sip. Unfortunately I have a very animated face and she just laughed! It tasted bitter and then with a smokey after taste…like drinking a mix of coffee and cigarettes! Hmm, not for me! Friday was the first of our Clare and Victor t0urs and we spent the whole day at Parque Nacional Los Alerces which is a national park 30 minutes from Trevelin full of lakes, rivers and forests in the foothills of the Andes. Our first stop in our 4×4 was at a viewpoint over looking a lagoon where we saw black necked swans and flamingos. As soon as we got out of the car we were hit with how crisp and fresh the air was. It was like you had a strong menthol sweet in your mouth every time you breathed. It was amazing. Especially coming from Gaiman/Puerto Madryn which were quite dusty. We then moved onto a spot just outside Villa Futalaufquen (the only settlement in the park- where all the park rangers live!) where, after walking a path edged with wild strawberries and purple Lupin flowers, we reached a cave with neolithic painting in it. These dated back before the Welsh, before the Indians to those who lived here then. Victor was really knowledgable about all the plants and animals and we ended up trying a fungus called llaollao which grows on a birch tree. It was creamy in colour and tasted sweet…like a mix between a dried apricot or an orange. It wasn´t the greatest! But the Indian women used to swear by it when they were pregnant as apparently it is very high in nutrients. So me and Hedd put it down as one of our 5 a day! 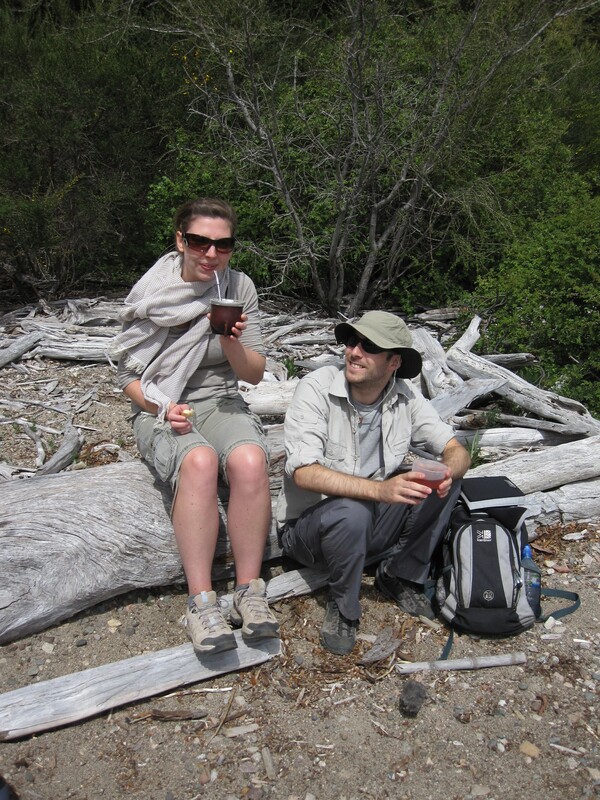 After stopping off at a waterfall we had lunch on the banks of Lago Futalaufquen. The lakes are so clear in the park that they act like a mirror. There wasn´t a cloud in the sky so Lake Futalaufquen was a bright blue colour and you saw the reflection of the Andes Mountains in it too…very beautiful. The water is pure too so you can drink from any of the lakes or rivers in the national park which we did throughout the day. Apparently the national park is the largest natural water source in the world. Pretty damn impressive! We ended our day in the park by going to Pasarela Rio Arrayanes which is a small island which joins 3 different lakes- Lago Futalaufquen, Lago Menendez and Lago Verde. From the name, you can gather that Lago Verde was green in colour. This is because the lakes waters reflect the thick vegetation that surrounds it which gives it a gorgeous turquoise-green appearance. We went on a hour walk around the island, stopping at a beach on Lago Verde to have mate whilst enjoying a view of a glacier. As you can see from the picture, I still wasn´t liking the mate! But the view was spectacular. We got back to the hostel early evening, drunk on fresh air with rosey cheeks and ready for bed. Day 2 of Clare and Victor tours was a trek up a 816 meter peak called ´Graig Goch´(´Red Rock´in Welsh). 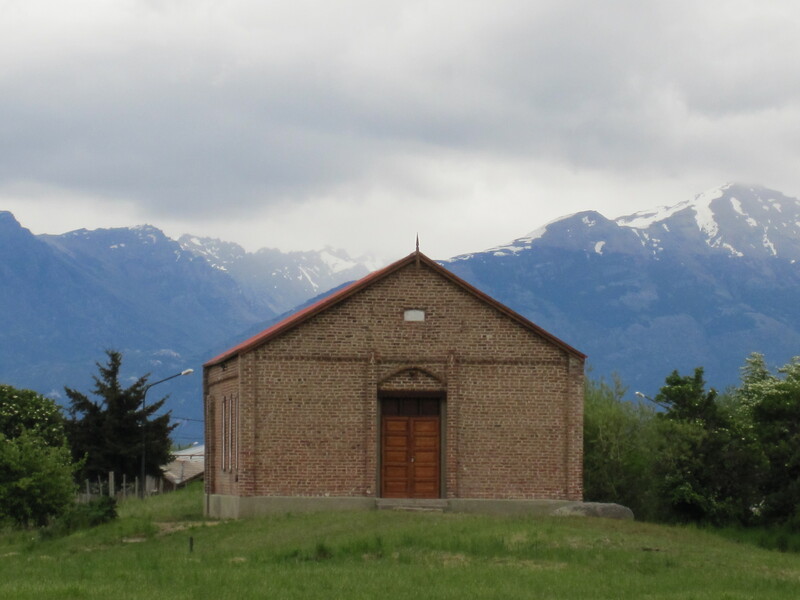 This was the plateux where the Welsh settlers who had travelled across the Chubut dessert from Gaiman arrived at to have first sight of the fertile valley and the Andes that surrounded it back in the 1890´s. 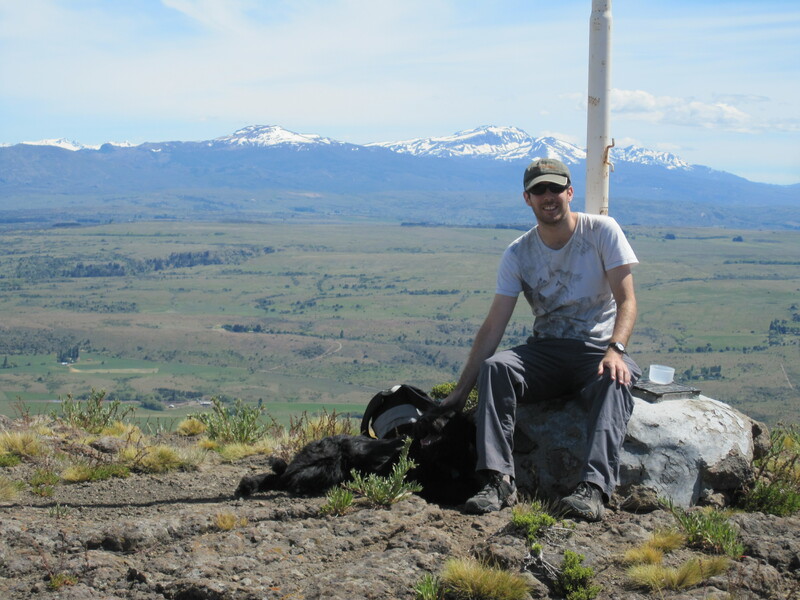 There is a ceremony each year where locals of Welsh origins walk up to the top along with the Argentine Army Band and they raise a Argentinean flag and sing the Argentinean national anthem and then the Welsh national anthem. Quite an emotional day I imagine. After a 2 hour walk which was tough going at times (and we were doing the easier route apparently!) we arrived at the top and my goodness was it worth it. An 180 panoramic view of the snow topped Andes and the valley below. It was breath-taking, really breath-taking. You could have sat there and watched the view for hours and I think we did to an extent. With mate of course! We eventually decided to make our way down. But not before seeing 3 Condor birds. These birds are at the top of the food chain and adults grow to a wing span of 3 meters. Our 3 were still juveniles with a wing span of 1 meter and 1/2 with white tips on their wings. They were a good spot! On the way down we saw lots of Ibis birds too. These ones have long curved beaks and you hear them before you see them…their squark sounds like the horn off a child´s toy car! After a well-earned siesta we met Clare and Victor at the local pizzeria called El Barataz off the main plaza which makes its own dark and blonde beer. It was the best pizza we´ve had and the blonde beer wasn´t too bad either! We sat with a family that Clare and Victor knew from the Welsh descendent community in the town. The mother of which called Margarette we found out is the lady who carves the Welsh love spoons which are then sold at the Welsh shop in Ruthin! Yet another crazy crazy coincidental connection! So today we find ourselves in Esquel for an overnight stop over before heading north to a town by a lake called Bariloche. I´ve very much enjoyed our time in Welsh Patagonia with all its unexpected familiarity, dramatic scenery and, at times, bewildering randomness! But as Clare says, ¨anything is possible in Patagonia¨! First sacrifice of the trip= My ipod, left on the overnight bus from Trelew! Knowing someone locally can make a massive difference when travelling. 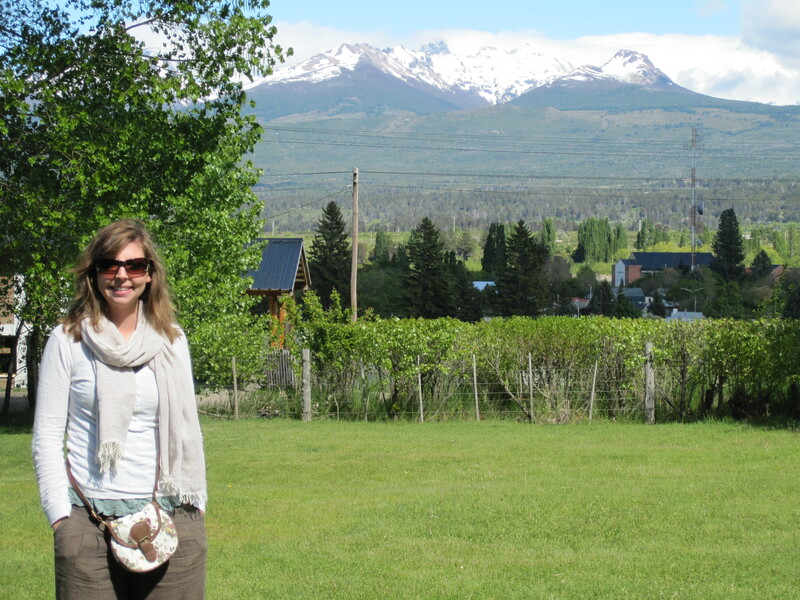 I have thoroughly enjoyed our stay in Trevelin and especially our hostel with that amazing view of the Andes. We had two fantastic day trips to the national park and up ´Graig Goch´, which we definitely would not have done had we simply arrived here as normal tourists. So i´d like to thank Clare and Victor for all their help and especially for their company over the past few days. I only wish we knew more people like them in South America…the next five weeks were on our own! !